Cause it kind of backfired on me this afternoon. After hours and hours of listening to Hannah Montana, I finally had enough and declared that the TV will be OFF until I say so. I challenged Maya to find something else besides the television to occupy her time. I was hoping that would send the kids outside to play or maybe encourage them to pick up a book. (I obviously don't think like a seven year old.) 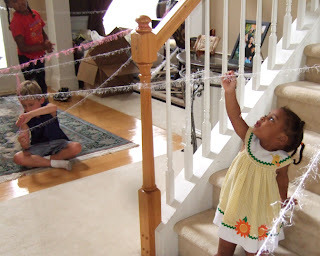 Maya and her friend, Patrick, decided to get creative inside the house. I don't blame them really; it was 96 degrees outside. But now my foyer looks like this! It's like a reenactment of the movie Entrapment. 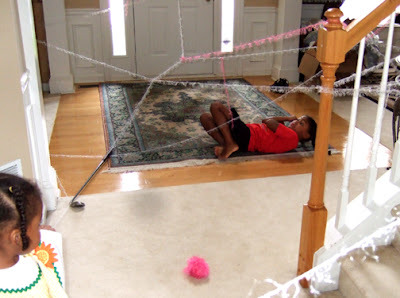 Hmmm... that looks like the work of some odd variety of a juvenile house spider. I agree. I think they were inspired by the new pet.